Cast members of âBen & Lauren: Happily Ever After?â raft Glenwood Canyon in August for an episode airing Tuesday. 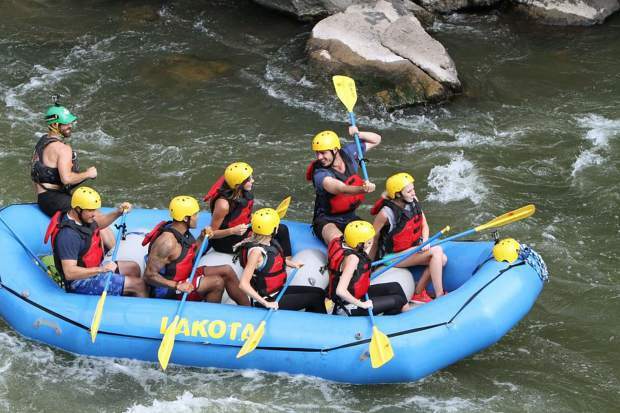 The show, a continuation and spin-off of “The Bachelor,” quietly filmed a rafting and camping trip in Glenwood Canyon in August. The outfitter for the event, Glenwood Adventure Company, has successfully kept it under wraps since then. “Ben & Lauren” is the first “post-Bachelor” show to follow a couple in their relationship following the “final rose” of the hit prime time reality show. The Glenwood Canyon episode is airing on Freeform (formerly ABC Family) and will be the season’s third episode. Ben Higgins, an Indiana native who’s been living in Denver for several years, was originally in an iteration of “The Bachelorette” and made it to the top four in the contest for the bachelorette’s heart. Later, the series brought him back as the pursued rather than pursuer for the 20th season of “The Bachelor.” There he met Lauren Bushnell and eventually chose her for the final rose. The producers were looking for the right place to shoot a rafting and camping trip, and Glenwood Canyon proved perfect on several levels, said Ken Murphy, whose Glenwood Adventure Company and his partner’s Bair Ranch served as the outfitters for the episode. “The producers found a spot at Bair Ranch that they decided gave them everything they were trying to achieve in a sense of what western Colorado looks like,” he said. “Glenwood Springs is gorgeous, one of the most beautiful places in the country,” Higgins told the Post Independent after filming. Higgins said they had a good fire and enjoyed a simple couple night of camping at the ranch. They shot all day at the ranch, where they camped, fished and got a few surprises at the campsite, which Murphy alluded to but wouldn’t reveal any spoilers. Ben and Lauren had both been rafting before, he said, so they considered it a necessity to get some friends out who’d never done it. Glenwood Adventure Company was a lot of fun and high energy, said Higgins. In the trip down Shoshone Rapids on the Colorado River, everyone stayed in the boat, and the water was at a good level to get everyone wet but not scare anyone, said Murphy. “Shoshone is a wonderful stretch to showcase whitewater rafting,” he said. For the whitewater filming Murphy had a couple of his senior guides commanding the trip, one boat full of the seven cast members, and another boat with the camera crew. Three more camera crews were on the bike trail adjacent to the river to film the boats, and another camera operator on a bike chasing alongside them. And finally the river guide and safety kayaker had GoPros on their helmets to catch even more action. “This was definitely a credit to my senior staff to be able to maneuver a raft down the rapids based on a film crew telling them where and when to stop,” said Murphy. To shoot in the canyon also required a permit from the White River National Forest, which Murphy said was very supportive of the project. “What it took to film this episode blew me away,” said Murphy. In total, the production crew was made up of about 35 people. While he and his company were trying to keep the filming as secret as possible, more than a few people at the beach recognized Higgins and Bushnell. So the cast inevitably got tangled in taking selfies with fans. Recently many film production companies have found Glenwood Springs to be ideally placed for many of their needs, with its accessibility to the interstate and airports and its proximity to great wilderness areas, he said. “The variety of what we have to offer is good for production companies. We’re on the map as a place to go and film,” Murphy said. Higgins said being on the show has been surreal at times. This show is different because it’s about building a relationship; it’s the culmination of the previous shows, he said. “I think Glenwood Springs was a great experience and an easy trek from Denver,” he said.